I love design. We are more and more a visual people, and so it follows that we are drawn to that which is aesthetically pleasing. No rocket science here. I found the following images in the Freeman Hall basement, where the printmaking and photography studio are located. 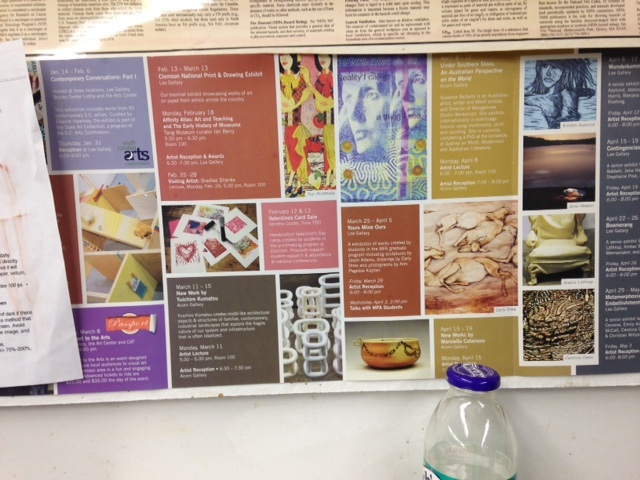 This first image is a poster displaying the various events going on within the Clemson art department. I love the grid structure and how it contains little bits of beautiful chaos in each cell. The juxtaposition of order and disorder come together beautifully here. Chip Kidd says, "everything that is not made by nature is designed by someone." This statement is actually pretty obvious, but I'd never really thought about it before, and I find it pretty interesting to think about. Though architecture is generally very different from books, there can be some connections. This image is from the botanical gardens. I don't really know what it means but it reminds me of some Little House on the Prairie type thing. The assigned reading for this week was really cool! It reminded me a lot of some of the criteria I learned in a Children’s Literature course, mainly because of the placement of the pictures in relationship to the text. The text wasn’t as important, because the adults were more focused on it, while the pictures took up the majority of the page so that children would enjoy it. It also reminds a lot of the Visual Communications course I am taking right now. We are studying widely circulating pictures in the media right now, and the types of responses and affects they have on global audiences. I’ve always enjoyed looking at pictures with designed purposes to try and figure out what the message is. The good, the bad... The creative? Reading Chip Kidd's book "Go" was both incredibly frightening and wonderfully delighting. Honestly, it was the most interesting book (design wise) that I've ever picked up. The design was incredibly intentional throughout the entire book, and that's what made it special. The first picture I took is of something we have all seen, I’m sure. It’s the giant screen that greets us when we walk into Cooper library. What I like about this design is that it is clean, organized, and informative. 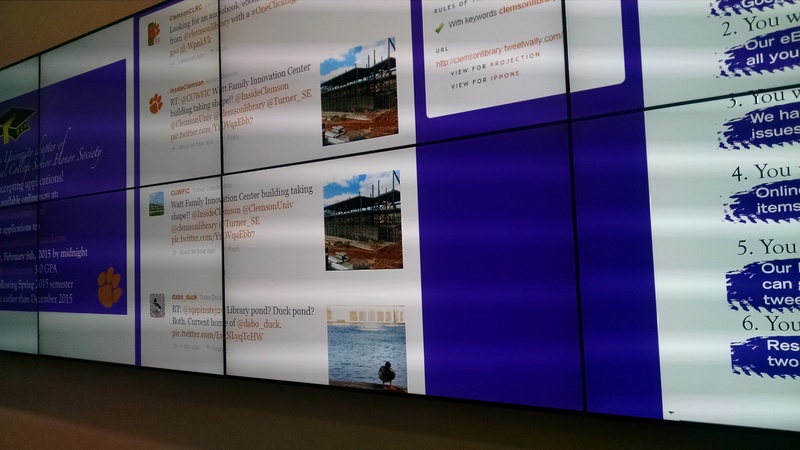 From the flashing pictures to the scrolling Tweets, this is one big designed screen! Read more about The good, the bad... The creative?